Good morning, night, early morning, late night, as you are seeing it, at the hour you see it. We are at + Motors here at + Canal, we are at the Auto Parts fair, at the 19th Auto Parts fair. We were in the innovation room with a fascinating topic on technology applied to mobility, among other things. We’ve always heard about GPS, we’ve also talked about satellite tracking, but here they explain a little more about what this is all about. 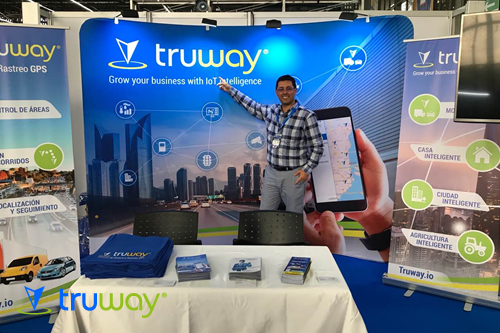 I’m with Juan Carlos Castañeda, he’s part of Truway, and he’s going to teach a little bit more about this subject because it’s apparently new and how it can be used from a private car, a motorcycle, to the delivery or cargo trucks and also the passenger buses. Juan Carlos, how are you? Welcome to Mas Motors. Mauricio, how have you been?, what a joy to be here and share this moment with you, greetings to all your audience that I see that you have many followers and I congratulate you, and well I’m happy, pleased to be here at the Auto Parts Fair here in Medellin this year it has been quite exciting, and sometimes we think that auto parts are like spare parts and not. Really nowadays, you know that technology has entered into all that is the global market worldwide, in all the different niches of the market and a very important issue is the vehicular part. The connection part, of connectivity and that’s why we have been working with Truway and everything that is the concept of the Internet of Things, what is that? What is the internet of things? Well, it is where we can really have connectivity of each of the different devices, for example it can be a vehicle, where I can basically have information about what is happening with my truck, not only at the satellite level to know where it is located but to have that vehicle to track it, to be able to see how the gasoline is, how is the level of the fluids, of the oil, and even to be able to know if the vehicle suffered a hit or if it is being driven improperly, or if there is a dangerous crossing, or even if it exceeds the speed allowed by the law. So all this information that the vehicle is generating nowadays. Moreover, more nowadays that all cars have a computer, the idea is that you can listen to all this information, and when you look to all this information, the idea is that you can process it, and not only have it and do nothing, but process it in order to give a better service, a better optimization, quality, effectiveness. Not just in my vehicle as a person, for example if I want to control my car, but also if I have a company and I want to manage my entire fleet of vehicles, to be able to control them, to be able to drive them, to be able to have an expense control, and to be able to be more productive and efficient when it comes to delivering a product when it comes to transporting children, when it comes to carrying adults; all this type of market is the one that Truway is entering actively today and begins to present here at the auto parts fair. Concerns are already arising, because today the connectivity is not the best; if we talk about Colombia, and I think that in any part of the world when we talk about 3G and 4G, we have to look for the possibility of maintaining that connectivity and the expression here is “there is no signal here” That is one of the first things or obstacles that can arise in these types of services, how can we start talking about this issue? How do we overcome this obstacle of non-connectivity at some points? It is true, well it’s a fascinating point that you take Why? Because it may be that you go in a vehicle and suddenly need a proper tracking and as you say, the signal went off. What has been working is in different aspects: One may be in one place an area where there is cellular connectivity but suddenly the message went off or the second may be that you are in a geographic area where there is no mobile connectivity. So two schemes are working based on the devices with Truway. The tools are capturing the information at the satellite level. First the device store it in RAMs, once it lost connectivity, the equipment keeps all records because it has a battery, and when it gets to have its new connectivity, it reports everything that was the history with respect to that type of activity of everything that is happening or everything you have programmed to monitor. When you are in geographic areas outside of cellular coverage, then we talk about satellite connectivity. Then there is already at the satellite level all the data management, not only the physical level but also the maritime level where you can send satellite information directly to the device. So that lends itself to those geographical areas or even everything that is the naval part that needs to be communicating and sending that information. Well, right now you were saying a word that I like, programming, because I can have a device that now I also ask you how it is connected or how it can be connected and what can I program? Because, yes, you talk about a device then you imagine a big thing because we need it to send the signal and it must be connected inside the engine or somewhere that someone says, well, there it is, and it can have space or the ability to transmit. What can I program? So how these devices, how are they? Well, it’s a fascinating subject that you ask, today the technology at the level of the devices if you remember the computers were big things, and today even a laptop, and inclusive today’s phones, is a computer really what we are taking there. They have created this GPS theme, the manufacturers have come to reduce so much that they are chips and inside that chip goes everything that is the GPS system but also what is the processing part, that is everything that handles all the information. So these devices or these appliances. Now I’m going to show you some so that you have an idea of how they look, how they appear, because yes, you can think that it is something huge but not; Today they are tiny devices can be as low as 5 by 5 centimeters can be some a little larger or smaller depending on the application if a motorcycle or if it is a larger vehicle or if it is a tractor then you are placing them, and these devices are connected; basically they are programmed through a USB port that through a computer you configure directly all the sensors that you are going to work. However, all that information with those sensors is available from different sources. One is the most common for example all vehicles have a connector that is a universal connector at the level of the part of the cars called OBDII that is universal you connect it and it is as if it were a serial port that is taking all the information from the vehicle and you are sensing everything that is happening, I don’t know if you’ve seen in your car sometimes that a little bulb, the small motor, the things of that. Yes, the car witness, that kind of information comes directly from the computer because he is sensing all the sensors of the vehicle and they are sending them directly to know if I have to change the oil or there is something wrong with the engine. When you connect this device in some workshops, they even use it to take the diagnosis. You go and say I have this error. Then you plug it in, and it shows you “you have to change the gas sensor…. the gas emission sensor” so it allows you that information. What Truway has been working on is taking that information and making that crucial information in real time to see what’s going on with your vehicle. Lets say that you have a fleet of 100 cars and not only you are measuring how it is the fuel level but also how it is the oil change, then it send me the alert to know the oil change, and you are taking that information, you receive it at binary level it is a computer information, of ones and zeros, but we process it, we send it to the cloud, and in the system that we have developed we are visualizing it, and we are activating each of the messages to take action. Where do we visualize it? Then he must have another little thing. An application or something to be imagining it and that now we also have the great scan that we have to do to the engines when this witness appears to me, and it determines me, or it diagnoses me what is happening with the driver, more or less. Yeah, correct, that’s it. What does this allow me? Then of course with all that information the idea for you is “ok, but I want to see it.” So the idea is that today we all have or the vast majority of people have a smartphone. So the idea is that you take your phone, download your Truway application, and know this information in real time directly from your phone, or if I have many vehicles I have my platform I logged in, and I start to see each one. I can see correctly, for example, the car as how it is in all its sensors, I can see exactly the location obviously, where I am, where it has been, or if the vehicle was parked in such a place, how long it lasted, what has been the average, for example, imagine that there is a very complicated traffic, what is the standard more or less of speed, right? Alternatively, if I’m exceeding the speed limit at a certain point it will generate alerts so visually it’s straightforward for you to know how is the behavior of the vehicle, How is the response of the person who is driving it and that allows you easy access to see all that kind of information. Since you have it located not only with this information if you do not have it located on a map, it also helps you to make decisions with routes. Say they look, and I can schedule….. let’s say you have five vehicles and you are going to deliver spare parts orders. Then you merely plan in the day all your cars and everyone knows their route, then you with the Truway system can program all the ways and it depends on the behavior of how is the traffic or something if you want to change it you can do it and notify directly to the driver to make his best route. You keep other, and it helps you not only for effectiveness because in the end it is productivity and gives you a very high level of performance for your company. We are only talking about engines because it concerns us, but we are also talking about private cars, but also about bus fleets, the issue of tourism. Which is something that security is implicit, explicit rather than inherent in Truway’s theme to even know how behaviors are within that audience that goes inside the bus? That’s what I was understanding. Yeah, you’re right. There’s an issue that as you’ve seen and we all like the video, right? Social networks, video and all this digital world. However, the fact is, to be monitoring. Truway has a particular camera that connected to the vehicle where it is filming, it is continually recording but at the moment that a specific event occurs, for example, a crash, a very sharp turn, an exit from a very dangerous curve or something that is not normal in the behavior of the vehicle, Truway automatically captures it and puts it directly on the screen so you will be watching it in real time, or watching all those events, what happened to my vehicle? And not only see what’s happening on the road but I can have internal cameras that allow me to see how is the driver’s behavior, or cameras to know how passengers are going, for example, if you are talking about older people, or if you are talking about even children, how the behavior is going, how everything is going. Alternatively, if you have a tractor truck where you need to be sure that the load is not going to open or that someone is not opening it, you have a camera that notifies you when there is a special event. It records for you but also tells you, that something is happening, a game, a notification. You will be able to have control over everything that is happening around you. I’m going to leave it there, as we say in good old country, “well chopped up with taste” so that you can get into Truway’s social networks, get to know more about it, get in touch with Juan Carlos and, I don’t know, get your hands on it, find out prices and so on. You can find us on social networks; the website is Truway T-r-u-w-a-y as it is here in the logo .io, i-o from the internet of things as I explained before. Also, you can look for us like Truway GPS, in all the social networks, on Twitter, on Instagram, on Facebook, on Youtube, we have videos. All this we have talked about, there are different video presentations, applications then you can see it. Moreover, you can reach us directly. We are headquartered directly in the United States, but we are also here in Colombia. In other words, distribution channels, installation sites, everything you need can contact us. There it is, technology within everyone’s reach. Because it is not too expensive for the benefits, it provides. I’m already talking about costs there a little bit, and you’ve seen the functionality and sizes. Moreover, if there is a place to install them, go ahead, the technology is to use it without fear to enjoy it. Also, that it not only provides us with the facilities but also helps us with the safety issues that are very important on these Colombian highways. See you, don’t forget to follow us to Mas Canal TV on Facebook, Twitter, Youtube, Instagram, and you can also write us at mascanaltv@gmail.com. Thank you very much, Juan Carlos. Thank you very much for everything, and we will be waiting for you in Miami. Oh hopefully, there we go, and you go to see how to install and tell them more, can happen here we are, tomorrow we do not know, and there we are. Truway so you can connect, and we have all of these fantastic services at our fingertips. A hug, see you, bye.